Our plumber installed this high efficiency wall mounted boiler with indirect hot water tank in Framingham MA. 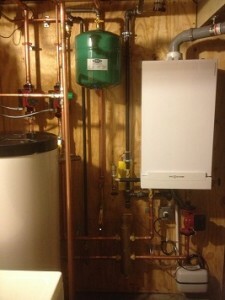 This system includes a Viessmann Vitodens 100 boiler and a SuperStor SS45 hot water tank. 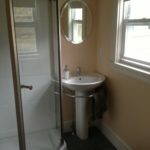 Our customer converted from oil to natural gas and will not only have huge savings on his heating bill, they saved space in their laundry room and got a tremendous rebate from MassSave. We handled the removal of all the old equipment and now they are enjoying all the benefits of natural gas. Call us to find out more details on converting from oil to natural gas. We can walk you through the entire process. Viessmann Vitodens 100 installation in Framingham MA. 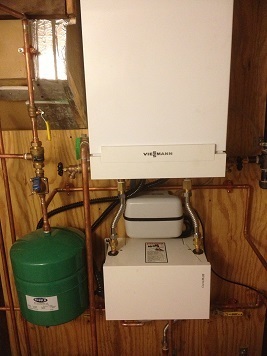 This unit includes a Viessmann Combi Plus on demand hot water heater. The Vitodens with the Combi Plus is eligible for a $1,200.00 rebate from Mass Save. The installation took just a few days and the customer will be saving money on their heating bill all winter long. The unlimited hot water will help keep their growing family happy. Laundry, showers, dishes… no problem. It is truly unlimited. Call Joe Kaufman Plumbing to have us come out and give you a free estimate on your boiler or hot water tank replacement. The heating season is here so call today.